IT’S THE 30th Anniversary of ET: The Extra-Terrestrialthis year. To mark the occasion, Universal Studios is re-releasing it on blu-ray come October and a clip of the new edition has been released showing the 1982 theatrical version of the movie in HD. 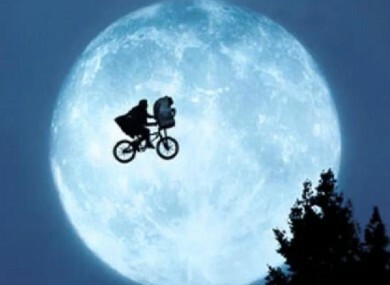 Phone home – The phrase is now a part of pop culture. Little Drew Barrymore – Starting her career, Drew Barrymore was even smaller and cuter than ET. Her godfather, the movie’s director Steven Spielberg, cast her in the breakout role. It went downhill a bit for her after that – but she looks happy enough these days. Looking like E.T. descriptions – ‘Geez he looks like ET’ – The alien from another planet has provided us with a useful phrase that we can use to describe someone you don’t think has the best features. However our very own Sinead O’Connor has recently said that she looks like the extra terrestrial – we don’t think so, Sinead. Speaking to radio host Ray D’Arcy on Today FM, when texters to the show complimented her looks, she scoffed and laughed “if you look like ET maybe”. The Irish link – While Elliott is freeing all the frogs from a dissection class, ET watches John Wayne kiss Maureen O’Hara in The Quiet Man. The movie was famously shot in Ireland with John Ford at the directorial helm and John Wayne strutting his stuff as an Irish-American. Through Elliott’s psychic link with ET, it causes him to kiss a girl he likes in the same manner. ET dressed-up – In order to get ET looking somewhat normal and human-like the kids dress him up in a conspicuous outfit. Alien in drag is not a good look. Flying Bikes – What’s not to like – they are bikes that fly. Enough said. The feelgood factor - There is never a dry eye in the house once ET utters the words “I’ll be right here” pointing to Elliot’s heart. (Eh… there’s just something in my eye, I swear). Email “VIDEO: 6 things to love about ET”. Feedback on “VIDEO: 6 things to love about ET”.